Image caption Billie Eilish: "Lyrics are so important. I don't think people realise how important they are". Billie Eilish may only be 15 years old, but she's already a formidable talent (and a real-life pirate, but more on that later). A member of the Los Angeles Children's Chorus, she wrote her first song - about falling into a black hole - when she was four. But it was her dance instructor who unlocked her talent for smart, dark pop songs when he asked her to submit a song for class. Along with her older brother Finneas, Billie came up with Ocean Eyes - an astonishingly assured ballad which compared falling in love to falling off a cliff under "napalm skies". She posted it on Soundcloud so her teacher could hear it, went to bed, and woke up to a flurry of emails about her burgeoning music career. Since then, she's been on a steep upswing, signed by Interscope Records and releasing one head-turning track after another. The highlight (so far) is Bellyache, in which she sings from the point of view of a conflicted psychopath. "Where's my mind?" she trills as an acoustic guitar trades blows with a gut-punch drum loop. "Maybe it's in the gutter, where I left my lover." It's the pop equivalent of a Tarantino movie - finding comic absurdity in the midst of eye-popping gore. The lyrics might keep it off the radio, but Billie isn't too worried. "I don't need many people to care," says the singer. "Even if other people don't like it, I like it." 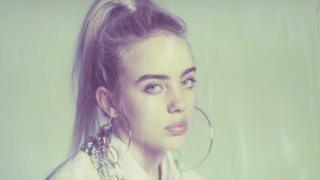 As she gears up to release her first EP, Eilish sat down for a frank chat with the BBC about her lyrical fantasies, getting to grips with the music industry and her very unusual middle name. Hello Billie Eilish… Have I pronounced that right? Yes! It's eye-lish, like eyelash with a lish. Your family name is O'Connell, though, so is that a stage name? It is my middle name. So I'm Bille Eilish Pirate Baird O'Connell. Pirate! That's an amazing name. Pretty weird, right? Pirate was going to be my middle name but then my uncle had a problem with it because pirates are bad. Then Baird is my mother's name. It's been a year since Ocean Eyes went onto Soundcloud. It was written for a dance class, right? Oh yeah! My dance teacher knew that I sing, so he asked us to make a song and I thought that was the coolest thing ever. My brother had written Ocean Eyes and we recorded it, basing all of the production around contemporary and lyrical dance. I think of most songs that way - if you can't dance to a song, it's not a song. Anyway, we put it on Soundcloud, literally to send the link to my teacher and then it just grew from there. It's been played more than nine million times now. When did you notice it was taking off? Image caption "I don't like it when people know my age," says the singer. What are those meetings like? Do you go in super-confident, like, "I've got the goods, what are you going to offer me?" or is it totally nerve-wracking? I was 13 when this started, so I didn't know anything about anything. I'd go into meetings and they'd say, "So Billie, what do you think?" and I'd just be like, "Am I supposed to know? Because I don't,". But eventually I got the hang of it. And now the meetings I have are a bit more like, "OK, Billie, what exactly do you want?' and then I explain every single detail of every single thing that I'm thinking; and people do it! It's insane. You have stuff floating around in your mind and you tell somebody and they go, "Oh yeah, we can make that happen". It's like, "What? WHY?". So it's like Spider-Man. With great power comes great responsibility. I am exactly like Spider-Man. I promise. I get the impression from your lyrics, especially, that you have a very clear idea of the things you want to talk about. How do you approach writing? Lyrics are so important but they're really underrated. So many lyrics right now are just the same thing - "Oh, I love you but I'm sad because you don't love me and... blah". You can say that in a more interesting way. Me and my brother write a lot of fiction. Like in Bellyache, obviously. I don't kill people. Right? But you can put yourself in a character or a situation you would not normally be in. You don't have to be in love to write a love song. You don't have to kill somebody to write a song about killing somebody. It's like jumping into another world. So do you consider it like acting? Or do you really want to murder someone, but haven't got round to it yet? But both of my parents are actors, and I was in plays when I was younger. Then I went to an audition and I came back going, "I hate this. I'm not doing this ever again." What happened at that audition? But it's just fun to get to tell a story [in a song]. If you just write about things you've been through, you might get to a point where you go, "I don't feel like this any more, so it's not worth pursuing". No. No. It's especially worth it. What's the lyric you're proudest of? Well, I wrote Bellyache with my brother, and he wrote Ocean Eyes, and we have a ton of other songs on the EP that I'm really excited about. Do you find you write better with him than anyone else? We've had sessions with artists and writers and producers and not that those sessions were bad, but when we write, just us together, it's so much more raw, I guess. And straight from the heart. I wasn't like, "Let's write a song about killing someone!". We were sitting in my garage rehearsing for a show with my brother's friends. Finneas started riffing on the guitar, and one of them started playing on the piano, and I sang the first line - "Sitting all alone, with a mouthful of gum in the driveway". Then my brother sang, "My friends aren't far, in the back of the car" and I was like "Lay their bodies," like I had killed them. And he just said, "Woah, that's so cool!". It just grew from there. He came into my room a couple of days later and he was like, 'dude, I wrote the chorus for this'. And he sang it all, and the last line was, "And now I got a bellyache" and I was like, "That is genius". It's such a childish line. No grown up says, "I have a bellyache, I gotta go". But it's kind of part of the song, because it's about someone whose really young and knows they're a psychopath. They're like, "Maybe I shouldn't steal this money and kill these people... but I'm going to anyway". It's a very cinematic lyric. You can see the film opening on you in the car, then the camera cuts to the bodies in the boot. Some people don't really realise what I'm saying until they've listened to it a couple of times. My friends would be like, "Dude I was listening to Bellyache the other day, actually listening to it, and what the hell were you writing about?". And then you say, "I'm glad you've heard it. Now never cross me again". Your new song is called Copycat. What's that about? You'll understand when you hear it, but it's about people who feel justified in copying everything you do. It's not about someone particular, I just wrote it. I had two sisters growing up - and that sort of thing seemed to happen quite frequently in their peer groups. Is it a girl thing? It probably is, and it's tortuous. Especially if it's somebody close to you. It's like, "Be your own self - don't try to be me!". You've just played your first headline show in the UK. Do you get nervous? Not really. I don't get nerves, I just get excited. Does your dance training help with confidence and stage presence? Yeah. I mean, I was really a dancer. Then I got injured, so I haven't really danced since Ocean Eyes came out. I strained my growth plate. My bone separated from my muscle in my hip. It was really bad. It's so weird, because it can't happen to you if you're over 16 - but I was in a class with a bunch of seniors, because I was at that level. We were doing hip-hop and it just popped. So I haven't really danced since then, which was like a year-and-a-half ago, which has been horrible. There is a dance video for Ocean Eyes, though, so are you on the mend? I was injured for the dance video, actually. I had sprained my ankle in December,and I had also strained my groin and I have shoulder problems. That's a sign to concentrate on the music. I guess it is, but I'm trying to get back into dance slowly. I love movement. I love moshing. I always heads right for the front and dig in there and mosh really hard with all the guys. None of the girls want to mosh, so I'm like the only girl getting punched in the face. Billie Eilish releases her new song, Copycat, today. Her previous singles, Ocean Eyes, Bored, Bellyache and Watch are all available now.